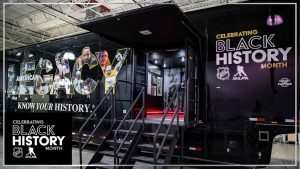 Together, the National Hockey League and American Legacy Magazine are bringing the past to life through an exciting mobile museum experience during February’s Black History Month. Celebrating 200+ years of black achievement in hockey, the Black Hockey History Bus Tour is making stops to honor the past and inspire the future. The 525-square foot museum looks back at the trailblazers and Stanley Cup champions. And the exhibit looks ahead to the next generation of young men and women in the game. The Black Hockey History Bus Tour is stopping at schools, community rinks, and six NHL arenas this month. To conclude its tour, the mobile museum visits the Washington Capitals at the Canadian Embassy, 11AM – 7PM, February 25-27. Community organizations including Players Against Hate have been invited to attend. For more information and all tour dates, see https://www.nhl.com/fans/black-hockey-history. This entry was tagged #al2019blackhockeyhistorytour, #americanlegacy, #blackachievementinhockey, #blackhistorymonth, #blackhockeyhistorytour, #hockeyisforeveryone, #knowyourhistory, #nhl. Bookmark the permalink.